“Chirping in the Chapel”, performed in Futuna Chapel Karori and St Peter’s Hall Paekakariki was surely their best concert ever. The 20-strong a capella choir treated their audience to an amazing programme of songs from 18 countries, performed in 15 different languages. The concert began with a powerful mihi, followed by Salaam/Shalom – a warm welcome indeed. From there, we were taken on a journey throughout the world and over time, celebrating the richness and diversity of human experience – stories of friendship and love, loss and grief, joy, humour, everyday life, death, peace and celebration. The choir’s musical performance, lightly choreographed, was polished to perfection, which is no mean feat for an a capella choir. 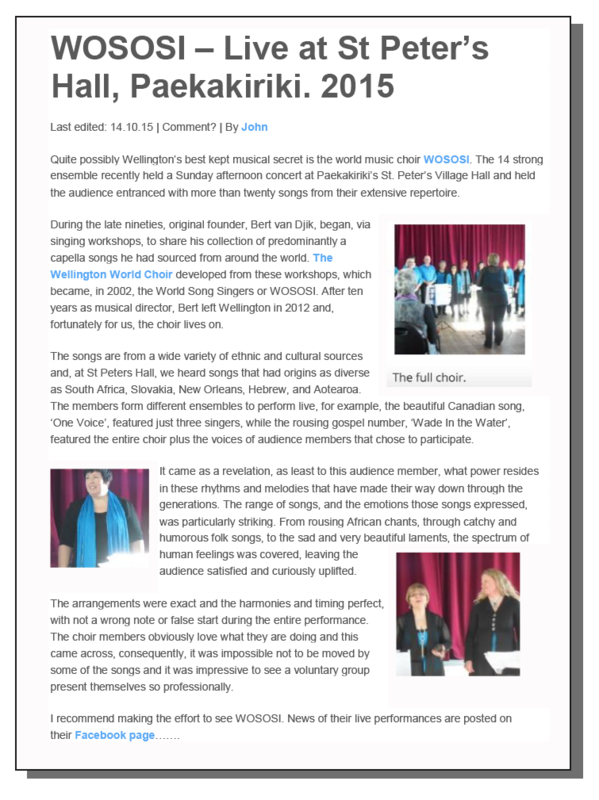 Wososi is ably led by Pam Hughes and Naomi Parker, but the choir works as a strong and cohesive team, with different members introducing the songs, taking a lead role, singing solo or singing in small groups. We as the audience felt involved from the start – there was plenty of head-nodding, foot-tapping, laughter and tears. At the end of this very moving concert, the audience were invited to join the choir in singing A I O, a beautiful Maori hymn for peace, truth, joy and love to the universe. A very fitting end to a stellar performance. As a member of two Wellington choirs it is always a pleasure to attend the performances of other local choirs - especially those of Wososi. Hearing and watching them perform is like a breath of fresh air. They are well organised and - dare I say it as an amateur? - perfectly pitched! 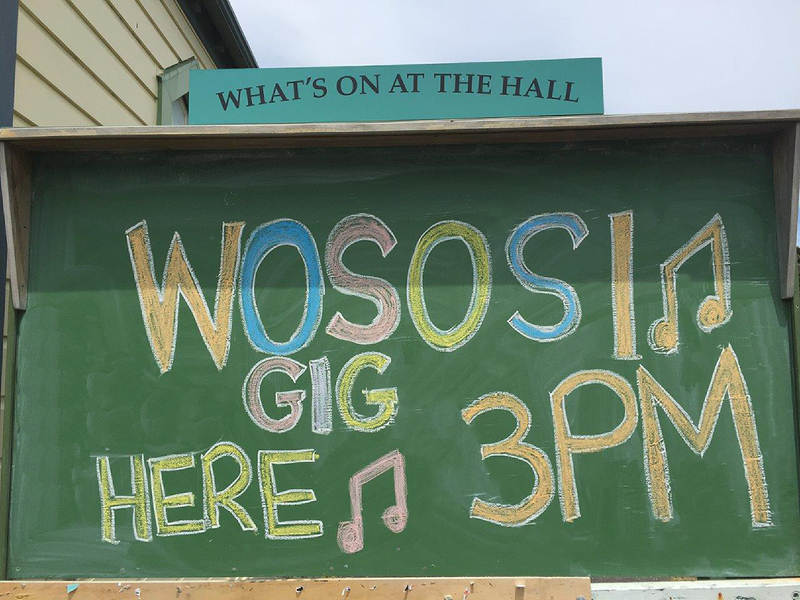 Wososi does not come across as an amateur choir, but rather as a group of professional singers who have studied hard to make their harmonies sound as beautiful and perfect as possible, while losing nothing of their vibrancy and openness. You can not help but want to sing along. During their performances I even came across some Latin-American songs that I know from my past and their arrangements are just lovely. Their CD is worth while ordering and listening to, too. It will leave you impressed. If I could make it work with my other commitments I would join in a heartbeat - if they would have me! I attended the Chirping in the Chapel concert by WOSOSI on 18 November 2017 and was blown away by them. I loved the way the concert started with a karanga- acknowledging that we are in Aotearoa and honouring the tangata whenua. 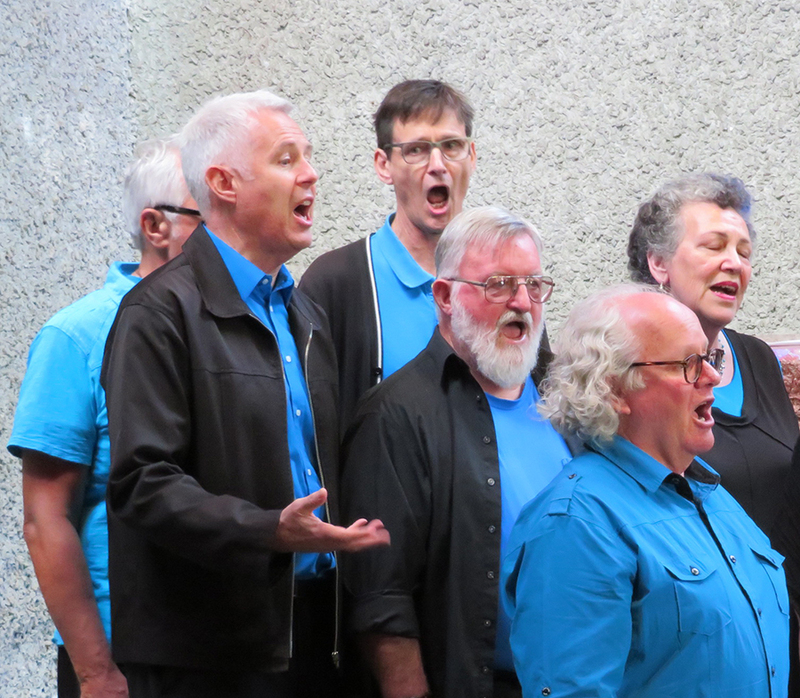 The repertoire was varied with a mix of slow, fast, loud, and softer numbers from countries around the world including Israel, Japan, South America, USA, Pacific Islands, Europe, and NZ. The singing was of a very high standard with lots of beautiful harmonies. I loved the boisterous African joy conveyed in E Marabini/Nkomo ka baba and the peaceful beauty of the Alleluia cycle put together by the talented Naomi Parker. Pam is an amazing song leader. I don’t know if you have ever seen her in action, but she puts her whole self into the music and conveys such energy and enthusiasm that it seems to buoy up the singers and unite them in song. If you can get to one of their concerts, do so! You won't be disappointed. In the meantime, I hope they record some of the numbers they performed at the recent concert so I can get some WOSOSI fixes in between concerts. Sylvia attended a birthday party where WOSOSI were the entertainment in November 2017. She wrote the following on a thank you card to the birthday girl. "What an amazing and beautifully musical performance - such verve, such skill, such joie de vivre! I've never heard anything like it before and was rapt right through the whole delightful programme. How I long to hear more choral groups like this these days - used to listen avidly to "World Music" on Radio N.Z. but its been replaced by very boring "pop" worse luck. Thanks so much for bringing them to sing for us!" editor at WCL after this concert. Click on the image to read it..